In today’s fast moving corporate world, the right digital infrastructure can make all the difference. Many businesses require specific digital tools to ensure their success. From customized off-the-shelf programs to tailored enterprise development initiatives, SRI Infotech has the expertise to build the desktop and mobile applications your organization needs to thrive. SRI InfoTech is a worldwide full-service IT outsourcing company. Founded in 2006 with headquarters in Norwood Massachusetts, we combine both on shore and off shore application development teams to ensure positive returns on your project. 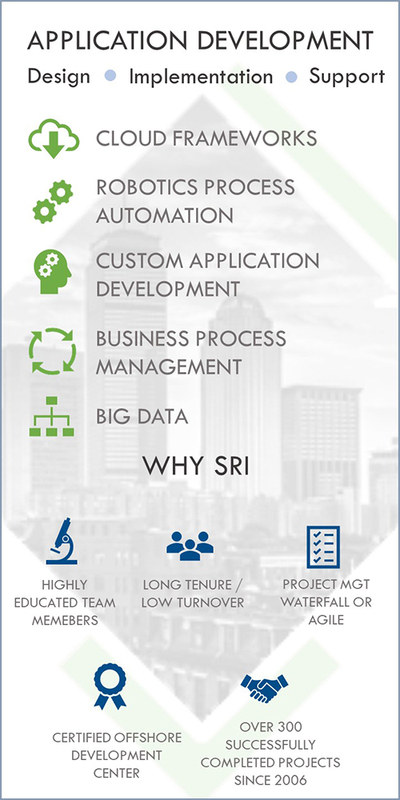 Through our experienced, highly educated team of technical resources deployed in North America and Europe, SRI can provide application development solutions for business process management, robotic process automation and artificial intelligence, as well as other custom enterprise application solutions. Our partners include Appian, Blue Prism, UiPath, SailPoint, IBM, Oracle, JD Edwards and Microsoft to name a few. We have developed and completed over 300 projects across the enterprise, including Cloud, Big Data, Blockchain, Security Accounting Systems, Management platforms and Robotic Process Automation. Moreover, we have provided these solutions as both standalone solutions and integrated custom application development services. SRI has a history of providing full trade lifecycle solutions from post-trade through settlement solutions to global financial entities around the world. We have also provided process outsourcing services from custody and fund administration services to asset management and financial services. We take great care with our discovery process, ensuring client requirements are understood and fulfilled the first time and on time. We operate as a true business partner and understand that culture and sensitive operating needs are critical to every project we engage. Having been in business for over 12 years, we have the agility and expertise to pivot when projects take unexpected turns. Our internal engagement process requires that team members that start a project are the ones who complete it, providing our clients with greater efficiency, constancy and accuracy. Furthermore, our skilled and experienced teams are comfortable working with the project management method adopted by your organization. Whether your management team prefers agile and iterative efforts or waterfall development with a logical start to finish sequence, our project managers and developers can work comfortably within your organization’s framework. As your staff augmentation partner, SRI can provide you with an extremely stable and well-polished onshore / offshore development team to help augment your in-house resources, and assist with the development and rollout of valuable solutions for both your employees and your customers. As a local company with worldwide reach, we provide both sophisticated services and support and excellent customer care. With SRI you get the professional capabilities of a large consulting firm with the personal touch of a boutique. All at a fraction of the cost of the typical cost. Please contact us today to discuss how SRI Infotech can help your organization with its application development efforts.